Screenshots - Copyright Infringement or Fair Use? You are visiting a website or working on a web application. You like the website and suddenly feel that it might be a good idea to cover it in your blog. You quickly take a few screenshots, write an article on your blog, and include these screenshots in your article . Have you done anything wrong? The answer is... May be. You might have broken copyright protection law. What is Copyright Protection?Copyright protection is a law that protects work from being copied or reproduced without permission from the owner. That way it encourages people to generate original work. Work includes articles, paintings, artwork and kinds of tangible content. But the Website does not say it is Copyright Protected? It does not matter. Even if the website does not explicitly mentions that the website content is copyright protected, it is still protected. Copyright protection is extended by default. You do not need to claim it like you need to claim patent or trademark. Exception to this protection will be when Owner explicitly waive the copyright. Examples of this waiver would be when Owner choose to place the content in public domain, or copyright the material using easier license such as "Creative Commons". What is Fair Use?Fair use is legally allowed defence against Copyright protection law. Fair Use allows use of copyrighted material without permission from Copyright owner in certain circumstances such as reviews, criticism, and news reporting. There is a quite a lot of ambiguity and it generally depends on a particular case whether using screenshot is copyright infringement or fair use. Here is a suggestion though. Limit use of screenshots. 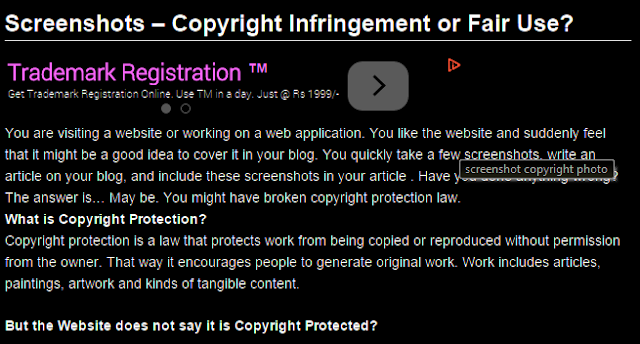 If your article is full of screenshots, chances are that it is going to be considered copyright infringement. If you use a small screenshot in a long article, it might be considered fair use. I am being sued by Getty Images for putting a screenshot of another website on my website because that website happened to use a copyrighted image as part of its design. I was only using the screenshot of the website to demonstrate an example of good web design, and now they are demanding mega bucks. I think this is highly unfair. Doesn't this come under 'Incidental inclusion of copyrighted material' or 'fair use'? I must be protected under fair use, as I was using the screenshot to explain what good web design is - so this falls under criticism, right?